Achates Power Inc. of San Diego, California, has put a news story from Voice of America of 22 March 2016 on its web site noting that the company, Delphi Automotive and Argonne National Laboratory will have a three-cylinder opposed piston engine in operation by 2018 that is "50 per cent more efficient compared to a downsized, turbocharged direct injection gasoline engine, while reducing the overall cost of the powertrain system”. 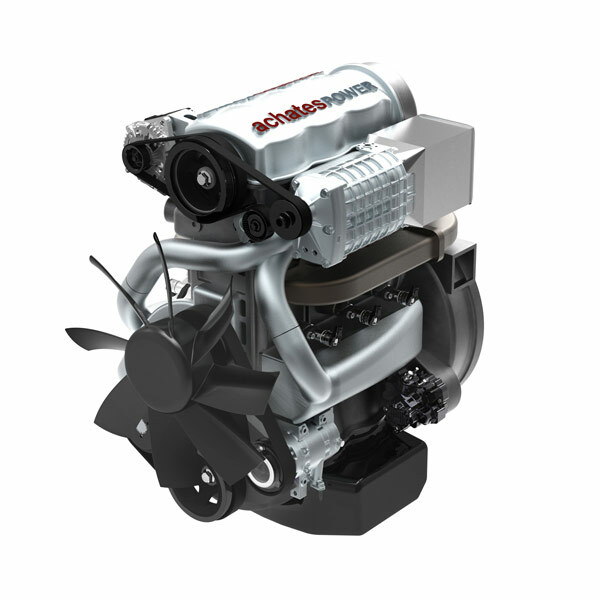 On 1 December 2015, Achates Power Inc. announced it had received a $9 million Federal grant to develop a more fuel-efficient engine. The three-year grant came from the US Department of Energy’s Advanced Research Projects Agency-Energy to support delivery of a three-cylinder, 3-litre opposed-piston gasoline compression engine for use in large sedans, trucks, SUVs and minivans, according to the company’s press release. Troy-based Delphi Automotive Plc, a partner in the project, is providing direct-injection equipment for the engine. The Lemont, Illinois-based Argonne National Laboratory will provide simulation and modeling for the project. The three organizations were expected to invest $13 million toward the programme, on top of the Federal grant, Achates said in a release. Achates Power claims it has given new life to the concept of the opposed-piston engine, mostly abandoned after the Second World War. “With the opposed-piston engine, you're able to achieve the efficiency of a much larger engine in a much smaller package," according to Fabien Redon of Achates Power. Two pistons move against each other in the cylinder, compressing a fuel-air mixture, which self-ignites, pushing the pistons apart and generating power. Exhaust gases escape through ports in the cylinder walls. Stripped of many conventional engine parts, the opposed-piston engine is said to be inexpensive and simple to manufacture. Generally, however, opposed-piston engines require two crankshafts. “We make sure that we do not over scavenge and achieve a very good combustion efficiency, so that unburned hydro-carbons and the emissions are reduced to a great extent," said Redon. As reported previously by autoindustrynewsletter.blogspot.co.uk Achates Power is working with Cummins Inc. On 30 March 2015 the companies announced a military engine contract worth $14 million for a “single-cylinder opposed-piston advanced combat engine”. Three features are critically important for combat vehicles: low heat rejection to coolant, high power density, and high efficiency. Those developing opposed-piston engines have declared an interest in taking advantages of the benefits of higher-strength compacted graphite iron (CGI) as cylinder block material. page 8 in this says CGI in the block. Other materials will not stand the high pressure. "Multi-Cylinder Modular Development Engine The A48-3-16 shares most of the power cylinder with the A48-1 and in an effort to reduce the development schedule, many components are compatible. Similar to the A48-1, the A48-3-16 is designed for a peak cylinder pressure of 200 bar with overload conditions of 220 bar. The block was cast from compacted graphite iron (CGI)."